In the new KALDEWEI BASSINO you can enjoy a completely new bathing experience. The innovative concept makes the dream come true of floating freely suspended in a shallow pool. Purist design with clean-cut interior lines creates generous proportions allowing you to lie back and relax in the water.The low height makes stepping into BASSINO exceptionally comfortable, while the vertical walls of this minimalist pool allow maximum space for showering. Get the Kaldewei BASSINO at eFaucets.com. We were the first to bring Kaldewei tubs to the online marketplace. eFaucets is the online leader for Faucets, bathtubs and shower systems. View the video below and prepare to be amazed. Breathtaking, extravagant, avant-garde. Even these superlatives can hardly do justice to the new, circular PIATTO shower plate. This elegant, innovative design object made of KALDEWEI steel enamel 3.5 mm unfolds a particularly striking effect in spacious surroundings. PIATTO combines the highest design standards with extremely comfortable showering. The cleverly conceived upturned edge lends the shower plate a lightweight, almost floating character. And as a complete ensemble with exclusive shower curtain the PIATTO shower becomes a flamboyant design object creating an unforgettable living space. Get the Kaldewei Piatto at eFaucets.com. We were the first to bring Kaldewei tubs to the online marketplace. eFaucets is the online leader for Faucets, bathtubs and shower systems. Latoscana is the land of great cultural and artistic values, "Birthplace of the Italian Renaissance", the age where the humanity and the modern conscience were born after a long period of decline, resume the 'Italian way of life', in the Culture, in the Aesthetic and in the Creativity. To this concept Latoscana Collection is inspired" to create the "Italian Bathroom Style". Where the beauty of the style is essential and follows the ultimate trends, mixing the refined old fashion with the newest finishing shapes. On the left is the Latoscana Ducale Kitchen Faucet. 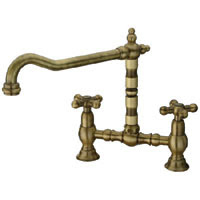 Above is the Latoscana Morgana 73CR214VR 8" widespread bathroom faucet. Check out the entire Morgana Collection. Find all Latoscana Faucets to inspire Italian Syle through out your home at eFaucets.com. We are the leading retailer of Latoscana Faucets nationwide. Free shipping over $99, Same Day Shipping, Low Price Guarantee, and excellent customer service. The Delta Faucet Company has grown to become the largest, most innovative and the leading faucet company in the industry. It's one of the most well known and recognized brands in America. In the early 1920s, Alex Manoogian migrated from Turkey to the United States as an entrepreneur. He wanted to escape a life of persecution in Turkey since he was of Armenian descent. He landed in Detroit, MI with his suitcase and no more the $50 in cash. Manoogian was determed to succeed and provide a better life for his family in the United States. He worked at various hard labor and machinist jobs until he had enough money to purchase a screw machine. Over time he saved enough money to invest in more equipment. In 1928 after 8 years of saving Manoogian and two business partners founded the Masco Screw Products Company. The company grew well in the first several years even through the Great Depression. By the mid-1930s, Masco’s annual sales broke the $1 million mark which was impressive in those days. In 1952, an eager inventor brought Manoogian his latest invention, a one-handled faucet that mixed both hot and cold water with a ball-valve. Unfortunately it leaked, but Manoogian saw potential. He therefore bought the faucet and its rights, improved it, and released it in 1954. 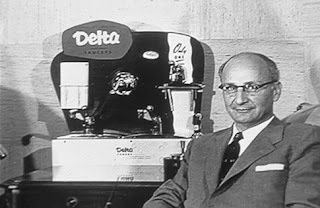 The brand name Delta was born. It was the first successful washerless ball valve faucet, and Manoogian called it the Delta Faucet after the shape of the internal cam, which resembles the fourth letter of the Greek alphabet: delta.It is the first single-handle kitchen faucet design. Delta Faucet Company was founded in 1954 as a Masco subsidiary. The original faucet remains successful, although other companies soon designed other single-handle faucets that didn't infringe Delta's patents. Some people preferred the internal design of the Delta faucets, even though they had to adjust them periodically. Hardware stores still stock internal parts for these faucets, both the 1952 and the 1962 design, although they don't all carry the complete faucets. 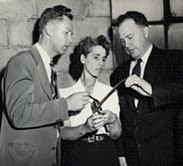 In 1958, the company opened a manufacturing facility in Greensburg, Indiana. In 1976, another facility in Chickasha, Oklahoma was opened (The Chickasha facility closed in 2006), followed by Jackson, Tennessee in 1995. The company operates three more manufacturing facilities outside the United States, two in Ontario, Canada and one in Panyu, China. Delta Faucet Company is currently headquartered in Indianapolis, Indiana. Delta Faucet Company has been the innovative leader in the faucet industry ever since and has had many technological breathroughs since which have revolutionized the faucet industry. eFaucets.com is the top Authorized Online Delta Faucet Partner carrying all of the innovative breakthroughs featured above. We have the largest selection of Faucets and decorative plumbing products at the lowest prices online. 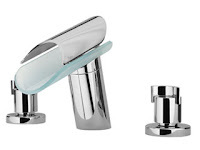 Free Shipping on all Delta Faucet orders over $99. Same Day shipping on all in stock orders if your order is placed before 3PM CST. Low Price Guarantee. We wont be undersold. Check out our Outlet for new open box products. The Delta Faucet Company has been the innovative leader in the faucet industry developing one break through technology after another. Every thing they have developed as revolutionized the plumbing industry. We have outlined some of the biggest Technological Breakthroughs Delta Faucet has created to date. Touch2O™ Technology: With Touch2O™ Technology it doesn't matter if you have two full hands or 10 messy fingers, tap anywhere on the spout or handle and the water is running. DIAMOND™ Seal Technology: Delta's exclusive DIAMOND Seal Technology uses a valve with a tough diamond coating to bring you a faucet built to last up to 5 million uses — plus it keeps water inside the faucet out of contact with potential metal contaminants. MagnaTite™ Docking: Delta's exclusive magnetic docking mechanism keeps the wand securely in place and guarantees that the spray head will never sag. Delta Monitor®: Delta Monitor faucets feature exclusive ScaldGuard® pressure balance valves to keep water temperature within a safe ±3° F, protecting you from sudden changes in hot or cold water pressure. TempAssure®: TempAssure® Thermostatic valves monitor the temperature of the water and adjust the mix automatically to maintain precise temperature control and to keep the water temperature in your shower within a safe ±3° F. This provides a more consistent temperature than pressure balanced valves can supply. Touch Clean®: Only Delta faucets are equipped with Touch-Clean® soft, rubber nubbins that allow you to easily wipe away calcium and lime build-up with the touch of a finger. Pascal Culinary Faucet: Introduced in 2006 by Brizo, Pascal™ is unlike anything on the market today. Featuring precise technology sure to change the way gourmet cooks and aspiring chefs work in the kitchen, it allows epicureans to activate water flow by either “tapping” the faucet or using the hands-free option. For added convenience, Pascal features a pull-down spout to simplify kitchen duties such as filling pots. Homeowners can conserve water and energy as they are less likely to leave the water running. The faucet also prevents the spread of germs and bacteria since water can be activated without using hands. MultiChoice Universal: In 2006, the tub/shower industry was transformed by the MultiChoice™ Universal valve, which enables trade professionals to make functional and stylish trim changes without ever changing the valve in the wall. One valve offers three function options: single-function pressure balance, dual-function pressure balance, and a new dual-function thermostatic valve cartridge. Delta Faucet Company is the first and only manufacturer to offer the ability to install both pressure balance and thermostatic cartridges in one valve. H2Okinetic Technology: Introduced to the market in 2005, H20kinetic Technology®, which is defined as the study of water in motion, is an innovative shower technology that uniquely shapes and affects the water it delivers, thereby enhancing the user's shower experience. Using only 1.6 gpm of water, but delivering a high-flow experience of 2.5 gpm, the technology gives homeowners a sensational shower experience while conserving water. H2Okinetics creates a warmer, more drenching shower experience by oscillating the water droplets. Additionally, water droplets are larger, enabling them to retain heat longer and enhance the comfort level of the shower. In 2006 this technology was integrated into the Delta Water-Efficient Showerhead, which uses up to 36% less water than standard showerheads. 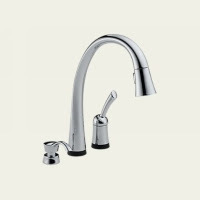 Integrated Pivoting Aerator: Each kitchen faucet in the Michael Graves Collection™ by Delta, which was introduced in 2004, comes standard with the first design integrated, pivoting aerator. With a simple twist, this two-function aerator can operate on spray or stream mode. The aerator also features Touch-Clean, Delta's proprietary spray face that is comprised of soft, rubber nubs that are easily cleaned by a fingertip touch, preventing lime and calcium build-up. Jetted Shower™: Revolutionizing bath technology, Delta introduced a new category of shower products with its Monitor® 1800 Series Jetted Shower. Introduced in 2001, this next-generation shower features two jet modules that provide an enhanced shower experience, plus an innovative valve design that allows plumbing contractors to install a Jetted Shower as easily as a regular shower or tub/shower combination. The Jetted Shower XO™ is even more versatile, with the option to add another set of jet modules, an extra showerhead or a hand-held shower. e-Flow faucet: In 2001, Delta introduced the industry's first hands-free electronic faucet designed specifically for residential applications. Combining form and function with sleek design, the e-Flow™ faucet features above-counter temperature control and convenient hands-free activation, perfect for use throughout the home. Quick Snap: Delta Faucet's patented Quick Snap® technology simplifies and speeds installation. Simply snap the quick connect hose in place and the faucet is connected to the water supply, no tools required. For two handle models, Delta Faucet's proprietary self-locating, “no adjust” handle bases adjust to the correct height every time, eliminating any guesswork. Quick Snap is available on all Delta and Brizo two-handle widespread faucets, kitchen deck faucets, and single-handle kitchen faucets with vegetable sprayers. Brilliance®: In 1996, Delta Faucet Company revolutionized the faucet industry with the introduction of its patented Brilliance anti-tarnish finish. The first company to use Physical Vapor Deposition (PVD) technology to create decorative finish options, Delta Faucet guarantees its Brilliance finishes for life to never tarnish, corrode or discolor. Moen was started in 1937 in Seattle, Washington, by a young college student named Al Moen who was working in his garage to earn his tuition money. While cleaning his garage one night after work, he turned on his old-fashioned two-handle faucet to wash his hands, and a sudden burst of hot water made him jump back in alarm. That single incident changed the world of plumbing forever. An idea popped into All Moen's head for the concept of a single-handle faucet. Meaning one handle to control hot and cold water. Al Moen once said, "it got me thinking that you ought to be able to get what you wanted out of a faucet. The more I thought about it, the more I was convinced that a single-handle mixing faucet was the answer, so I began to make some drawings." Well it took Al Moen countless tries to sell his concept to plumbing products manufacturers. Al worked on many revisions over the years. World War II put his project on hold, as materials were shifted as priorty for the war effort. 10 years later in 1947, Al finally found an interested manufacturer named Ravenna Metal Products of Seattle. Ravenna sold their first 250 Moen faucets to a San Francisco plumbing supplier. The Moen single handle faucet was on its way to becoming a household name, not only in North America, but in approximately 55 countries around the world today. 10 years later in 1959, the Moen single-handle faucet was a hit. It made its way into hundreds of thousands of homes in the U.S., buoyed by the post-war construction boom. In 1959, a survey of the world's leading designers, published in FORTUNE magazine, named the Moen single-handle faucet as one of the top 100 best designed mass-produced products of modern times. Another FORTUNE article published in 1991 listed Moen faucets as a part of "100 of America's Best." Who would have known that the single-handle faucet could have changed the world so much. Al Moen headed Moen Incorporated's research and development group until his retirement in 1982. He held over 75 patents, including the replaceable cartridge (eliminating washers in faucets), the screen aerator, push-button shower valve diverter, swivel spray, pressure balancing shower valve and flow control aerator. Moen changed the world of faucets and plumbing forever. Many of his patents were in fields totally unrelated to plumbing. A nominee for the National Inventors Hall of Fame, Al Moen has been honored by the plumbing industry, being named to the Kitchen & Bath Hall of Fame in 1993. His genius is perhaps best summed up by the simple title that appeared on his business card -- Al Moen, Inventor. eFaucets.com is the leading online retailer partner for Moen Faucets, showers and accessories. We carry every product and all Moen Replacement Parts. Low Prices, every available product, Same Day Shipping, Free Shipping over $99 excluding freight, and excellent customer service. Timeless designs. Styles unlike anything else. Faucets and fixtures that are livable and enduring. These are just some of the reasons that Moen Inc is the number one brand of faucet in North America. But, Moen does more than make faucets. It's also a major supplier of stylish kitchen sinks and innovative bath accessories. Moen is part of Fortune Brands´ Home and Hardware group - a leading consumer brands company that includes leading cabinetry, door and lock manufacturers. ChoiceFlo ™ the first filtering faucet to feature dual waterways in the spout - with two independent valves - to allow for both filtered and non-filtered water. M-PACT® common valve system that allows consumers to upgrade their faucets without replacing existing plumbing. In 2004, Moen launched ShowHouse ® by Moen®, a new line of luxury faucets and accessories for the kitchen and bath, featuring cutting-edge affordable styles for fashion-conscious homeowners. For the kitchen and bath, ShowHouse by Moen offers styles that range from sleek and modern to refined and traditional. Products include kitchen, preparatory and bath faucets, luxurious shower, spa and tub faucet options and a complete line of coordinating bath accessories. All are available in beautiful designer finishes. The line also features exclusive powder room collections with uniquely designed faucets and accessories for a coordinated look in the one room your guests are certain to use. The Moen brand was developed by Al Moen in 1937 as a college student. By 1947 Al Moen finally got an interested manufacturer, named Revenna Metal Products, to produce its products. Read our article about The History of Moen. Moen, originally part of Ravenna Metal Products of Seattle, Washington, became part of Stanadyne, Inc., in 1956 as the Company's only consumer brand. Stanadyne was acquired in 1988 by Forstmann-Little & Company. In 1989, Moen was given the status of an independent company and renamed Moen Incorporated before being purchased by MasterBrand Industries, Inc., an operating company of American Brands, in 1990. American Brands became Fortune Brands in 1997, and Moen is now part of the Fortune Brands Home and Hardware group. In the time that Moen has been part of the Fortune Brands family, it has introduced a wide range of consumer-preferred, stylish products - positioning Moen as the number one plumbing brand, both in market share and in the minds of consumers. Not only is eFaucets.com located in Racine, WI, but it is the home and headquarters to the legendary InSinkErator. It has been an influential part of our City and history. Being in the same neighborhood also gives our team the ability to stop by for plant and product tours. We thought we would stop by the Racine History Museum to get some background on the company and view their first garbage disposal inventions. It was amazing to see. 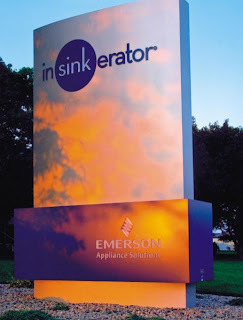 InSinkErator, is a division of Emerson (NYSE: EMR) which is the world's largest manufacturer of food waste disposers and instant hot water dispensers for home and commercial use. Emerson, based in St. Louis, Missouri, is a global leader in bringing technology and engineering together to provide innovative solutions to customers through its network power, process management, industrial automation, climate technologies, and appliance and tools businesses. Sales in fiscal 2008 were $24.8 billion. 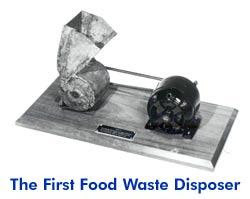 In 1927, the world's first food waste disposer was created a few blocks from the current World Headquarters. A Racine architect by the name John W. Hammes came up with the idea, perfected and patented it, and founded the company that from day one has been the world's largest manufacturer of disposers. No-nonsense. Utilitarian. And those are some of the kinder words that can be used to describe the kitchens of the 1930s. Cabinets, appliances and sinks were typically free-standing — on four legs. Most everything was stark white enamel, with the exception of the checkerboard linoleum floor. Even though the leading cookbook of the era proclaimed cooking a joy, it didn't always feel that way with so many inconvenient kitchen tasks. InSinkErator founder John W. Hammes, a Racine, Wisconsin architect, was first to solve one major inconvenience: disposing of food scraps. In 1927, he built the first food waste disposer in his basement workshop. After eleven years of testing and development, InSinkErator Manufacturing Co. was established, making and selling 52 disposers in 1938. A slow start, to be sure — but an auspicious one. The linoleum floors took on brighter patterns, with grays and reds adding touches of color, as the kitchens of the 1940s started their march into the modern era. Home freezers, combination refrigerator/freezers and electric mixers stepped into the spotlight. Amazing new products including frozen orange juice, instant mashed potatoes and aerosol whipping cream were introduced — and we learned about them through recipes from the magazine that made our homes and gardens better. InSinkErator also became an integral part of the new American kitchen. While they were occupied making defense parts during the war years, after the war they turned their attention to convincing cities and towns to allow — and often mandate — the use of disposers. Insinkerator also made a key decision that set the stage for their future success: selling disposers exclusively through plumbing contractors. Postwar kitchens of the 1950s reflected the new American optimism: clean lines, cheerful colors, and built-ins everywhere. Appliances took on a softer look with pink, aqua, yellow and other pastel shades. Suburban homes featured galley kitchens with such space saving innovations as the double oven — used most often to cook frozen TV dinners. We drank the powdered orange drink preferred by astronauts, and we prepared meals by following the color pictures in Betty's famous red cookbook.While our lifestyles were dramatically changing, InSinkErator was keeping pace. They expanded our Racine facilities to produce commercial products for restaurants and hospitals. They met the challenge of growing competition with national advertising campaigns featuring such celebrities as Burns & Allen and Phyllis Diller. They launched a direct sales force, plus a network of independent service representatives. And Insinkerator introduced their gold standard Model 77 disposer, the first in the industry to include a five-year parts warranty. American kitchens renewed themselves in the 1960s; taking full advantage of the decade's advancements in materials and technology. In came new self cleaning ovens, side by side refrigerators, countertop blenders and more in shades of avocado, coppertone and gold. New plastic laminates covered our countertops, and new vinyl floorcoverings — or indoor-outdoor carpeting — added softness underfoot. We shaked and baked our chickens, and we watched Julia's famous cooking show on TV.In like manner, InSinkErator made the most of its expanded capabilities. They developed the "Quick Lock" mounting assembly to speed disposer replacement. Insinkerator built a new Racine plant — then (at 243,000 square feet) and now (at nearly 400,000 square feet) the world's largest facility devoted exclusively to disposer production. They entered international markets for the first time. Moreover, they gained a solid base for continued growth when Emerson Electric Co. acquired them in 1968. With the Bicentennial the defining event of the decade, kitchens outwardly adopted a homespun look. Country motifs were popular. Almond, wheat, and good-old-fashioned white were the leading appliance shades. Natural grains and health foods were displayed on butcher-block countertops, right next to vegetarian and low-calorie cookbooks. But in reality, cooking was all about speed thanks to the introduction of the countertop microwave oven — plus dozens of new quick-cooking products that helped us with our hamburger and more.InSinkErator was on the leading edge of this trend with the introduction of the instant hot water dispenser — an indispensable appliance for time-conscious cooks. As for disposers, Insinkerator formally became number one in disposer market share, with the InSinkErator name on one out of every two units sold in the U.S. To keep up with their explosive growth, Insinkerator expanded their Racine plant. And we began marketing their new Badger line of disposers to the booming residential construction market. Things really started to heat up in home kitchens, as enthusiasts were taking more and more cues from commercial chefs. Pantries reappeared to hold the larger stock of ingredients cooks wanted. Stainless steel made its debut in appliances. New non-porous materials brought us smooth-top ranges and solid surface countertops — on which you were sure to find a souped-up food processor. And we blackened absolutely everything, from fish to spaghetti, following recipes from Chef Paul's New Orleans kitchen. Activity in Racine was also on the front burner, as both their sales growth and market share continued to increase. 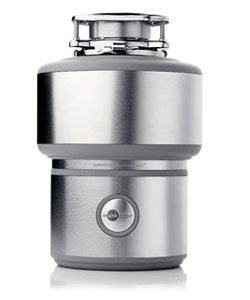 Insinkerator introduced their super-premium Classic model, the forerunner to today's Model 777ss. They enhanced their commitment to wholesale distributors, and we increased our retail presence through new relationships with home improvement megastores. By InSinkErator's 50th anniversary in 1988, an estimated 75 percent of all contractors included disposers in new residential homes. Beeps. Buzzers. Bytes not just of food, but of silicon. Throughout the nineties, kitchens made their entrance into the computer age. Digital readouts did away with dials and gauges. Touch controls replaced knobs and levers. User-programmable cycles were built into ranges, refrigerators, even toasters and blenders. Home cooks replaced their index card files with database programs, and cyberspace became the hot place to find and exchange recipes — on CD ROM cookbooks, on e-mail lists, on Martha's web site. InSinkErator was becoming wired as well. They expanded their electronic data interchange system for full e-commerce capabilities, so distributors could use the emerging Internet to place orders and track purchases. They developed a Skills Center to expand employees' knowledge of computer systems and software. By the end of the decade, as more communities throughout the U.S. made food waste disposers mandatory, InSinkErator was the homeowners' brand of choice at all leading home improvement retailers. Changing Needs. Call it feng shui or call it fusion. For the new century, kitchens reflect a balance of sophistication and simplicity. Ultra high-tech appliances, from fuzz y logic rice cookers to voice-command microwave ovens, are placed on countertops of natural marble and granite. Bold neon accents contrast with color schemes straight from nature. While we dazzle our guests with recipes from Wolfgang, Mario and Charlie, we stock our shelves with lowfat snacks and cholesterol-lowering spreads.In a word, it's all about comfort. People want more relaxed environments — and that means kitchen solutions that save time and boost efficiency while providing the quality that ensures peace of mind. At InSinkErator, we're uniquely able to satisfy this desire. As the best-selling food waste disposer brand in the world — and the leading brand of instant hot water dispensers and point-of-use water heaters — our products have earned the trust of contractors, dealers and consumers in over 80 countries. And as Insinkerator moves forward in the 21st century, they will be building on their heritage to achieve new milestones in kitchen convenience. In the digital ecommerce age online retailers like eFaucets.com have become major retailers in the sales and distribution of Insinkerator products. Sites like eFaucets.com have endless shelves of products and carry every manufacturer's SKUs. This means you are sure to find every product you need and have it shipped out the door the same day with Free Shipping. We new phone applications like the iphone you can order from almost anywhere on the go. eFaucets® has all your designer plumbing needs for Faucets, Garbage Disposals, Hot Water Dispensers, Water filtration; etc. Shop our Outlet for new open box items at discount prices. eFaucets® is the Faucet leader and Faucet Expert.™ Get free shipping on all InSinkerator garbage disposer, faucet and accessory orders over $99. 30 minutes to make a statement that lasts a lifetime. Upgrade plain, plate-glass mirrors with the unmistakable appearance of a beautiful custom-made frame... in about 30 minutes. Choose from a portfolio of styles and finishes that will enhance the look of your bath and reflect your personal style. Mirrorscapes is a Creative Specialities product which is a division of Moen, Inc. Learn how to create a custom look without cutting corners – in about 30 minutes. Read the simple, step-by-step Mirrorscape installation instructions or follow along with our demo and installation video below. All it takes is a little finishing touch. More. The days of the luxury bidet are gone. Now the Washlet by Toto has revolutionized the luxury toilet market. The Toto Washlet is taking America by storm. The washlet is the first toilet seat with a built in bidet. It includes features such as blow dryer, heated seat, massage options, water jet adjustments, automatic lid opening, automatic flushing, wireless control panel, room heating and air conditioning for the room—included either as part of the toilet or in the seat. These features can be accessed by an (often wireless) control panel attached to the seat or mounted on a nearby wall. There are several models depending on your budget and how many features you desire to include. This is the "gotta have it" feature for any home. How does the Washlet work?The Toto Washlet is designed to introduce you to a level unprecedented comfort, while delivering on the promise of maximum cleanliness. At your command, an integrated, self-cleaning nozzle extends to release a warm, soothing stream of aerated water to provide the ultimate in personal cleansing. The C100 leaves you feeling renewed, refreshed and indulged with dual-action warm water cleansing, a heated SoftClose® seat and a convenient integrated activation panel. The entry-level Washlet gets a sleek facelift with the new C110’s streamlined, slimmer side- control panel. All of Washlet’s features point to comfort, hygiene, ecology, innovation and value. With the touch of a button, a nozzle extends from under the seat for soothing warm-water cleansing, virtually eliminating the need for toilet paper. The nozzle, which selfcleans before and after every use, can be set to move back-and-forth for maximum comfort and optimum cleansing. The specially designed contoured seat is also heated to provide maximum comfort. The Next Level in Washlet® Luxury. The E200 offers a contoured design for a sleeker look and uncompromised Washlet luxury. The E200 includes soothing dual-action cleansing modes; a warm air dryer; a wireless remote control and a heated SoftClose® seat. Discover an Unparalleled Cleansing Experience. Providing an unsurpassed Washlet® experience, the S300 cleans, soothes and pampers you with five warm water cleansing modes; a warm air dryer; an adjustable cleansing wand; a wireless remote; a heated SoftClose® seat; and an automatic air purifier. Elevate the experience with the Washlet® S400. It’s the first Washlet seat that combines the convenience of a hands-free flush with an automatic open & close lid. Kitchen Faucets were once simply just a mundane kitchen necessity for washing dishes, food prep and water supply. Kitchen faucets have now evolved into the center piece of the home. The entire home is now designed around the style of the kitchen. The kitchen is no longer a hidden room just used to prepare dinners that you guests couldn't see you working in. Kitchen walls have opened up and kitchens have been expanded to be the meeting place for when guests come over. Entertainment and bar sinks now go into kitchen islands to serve drinks and appetizers. We are seeing many kitchens with up to 6 or more kitchen faucets. Function has expanded into muliple places. A Kitchen Faucet in the main sink for washing dishes. Wall Mount Pot Filler Kitchen Faucets over the stove to fill up cooking pots and sauce pans quickly without heavy lifting. Entertainment or bar sink faucets for drink serving in the kitchen island. Food prep faucets adjacent to food prep sinks and in-counter vegetable steamers. Water filtration faucets for pure drinking water and hot water dispensers for instant hot water for tea, soup or heating up baby bottels. Manufactures are now turning kitchen faucets into attention getting features and packing them with lots of innovative added function. They now come in more shapes, styles, finishes and functions than ever before. Attention getters also include commercial or professional grade pull down faucets typically found in high end restaurants known as Pro-rinse faucets Read our kitchen faucets buying guide to help you decide which faucet style will fit your kitchen design and cooking needs the best. The kitchen faucet is one of the most used items in the home. In kitchen faucets the cost is relative to it's construction and inner workings. As a faucet goes up in price, the more durable, functional and long lasting it should be. Based on your demands and usage make sure you budget appropriately. Be sure to look at customer product ratings in the search results. There are many types, styles and finishes to choose from. If you read our kitchen faucet buying guide you will get more in depth information on the different types, styles and functions of kitchen faucets. Be sure to also visit our kitchen sinks page if you need help selecting a sink that compliments the style of your kitchen and new faucet. If you are looking for other faucets then we are bound to have it carrying the largest selection in the faucet universe. Be sure to check out our Designer Plumbing Outlet which includes clearance items, close outs and open box faucets at outlet prices. So you’re in your kitchen mixing cookie dough with your bare hands. You need to wash your hands when you are done and don’t want to dirty up or contaminate the faucet spout. Don’t worry the future is here with wife Jane’s kitchen from the Jetson’s now being the present. Take your elbow or forearm and just tap the faucet anywhere. The magic amazes you as the faucet turns on and off with just a touch. The entire faucet is the on/off switch with an electronic valve. Delta Faucet Company is the innovative leader in Faucets so leave it to Delta Faucet to revolutionize the faucet industry again with a touch sensitive faucet. Only a company the size of Delta can bring this kind of technology to market at such a cost savings. Touch2O™ technology was originally designed for its high end Brizo brand and only Delta can bring this first-to-market technology to its main stream brand. Delta is launching this in their main stream brand in the Pilar series of faucets. Pilar is a distinctive kitchen faucet that coordinates with any décor and provides all the convenient functionality Touch2O™ Technology has to offer. Pilar also features Delta's exclusive MagnaTite™ Docking to keep the wand securely in place. The Delta Pilar Faucet comes in two options. The Delta 980T-DST without the soap dispenser and the Delta 980T-SD-DST with the soap dispenser.